American officials told a Palestinian delegation in a closed door meeting that the U.S. would not veto a UN Security Council resolution against Israeli settlements, according to a newly leaked document. 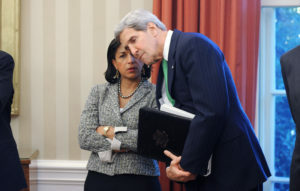 U.S. Secretary of State John Kerry and White House National Security Adviser Susan Rice told a Palestinian delegation in Washington 10 days before the UN vote that the U.S. would not impose a veto on the anti-Israel resolution “if its wording was balanced,” according to a document released by the Egyptian news site Al-Youm Al-Sabaa. The five-page document in Arabic was most likely leaked by officials in the Egyptian government, observers say. According to the document, Kerry and Rice said America’s UN Ambassador Samantha Power was prepared to meet with Palestinian UN Ambassador Riyad Mansour to discuss the resolution. Rice and Kerry are said to have asked Palestinian Liberation Organization Secretary General Saeb Erekat and the other members of the delegation to keep the meeting top secret. “Kerry and Rice said they wanted to avoid leaks of the meeting to the media because of the sensitivity of the transition to the Trump administration,” Haaretz reported on Dec. 28. The newspaper is working to confirm the report. The document quotes Rice as asking Erekat what the Palestinians would do if Trump moved the U.S. embassy from Tel Aviv to Jerusalem and made it possible for Israel to annex part of the West Bank. It quotes Erekat as replying that the Palestinians would immediately join 16 UN agencies in which they were not yet members, retract the PLO’s recognition of Israel, freeze security cooperation and diplomatic and economic ties with Israel, make Israel responsible for the management of daily life in the PA, and call on all Arab countries to expel U.S. ambassadors. In response to the reports, State Department Deputy Spokesman Mark Toner denied the contents of the document. If authentic, the document reinforces some of the claims of U.S. collusion that Israel has raised in recent days. Ron Dermer, Israel’s ambassador to the UN, said on Dec. 26 that Israel had evidence that the Obama administration was behind the wording of the resolution and had cooperated with the Palestinians behind Israel’s back.